*Pirates will seize any vessel if there is a chance for payment- whether through monetary means or goods. This article describes the capture of a yacht that had been previously warned not to sail through those waters. From yachts to container ships- to vessel is immune to seizure in this area. One French hostage has died and four others have been freed in a rescue operation by French troops on a yacht off Somalia, French officials say. Two pirates were killed in the operation and three were captured, the French presidency says. 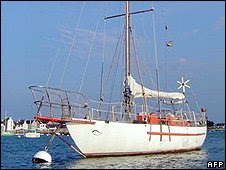 Two French couples had been seized with a child, who was among those freed from the yacht, Tanit, seized last week. The operation came after a US captain made an unsuccessful overnight bid to escape from another seized vessel. Captain Richard Phillips managed to jump overboard off the lifeboat on which he was being held by pirates, US media reported. But his attempt to reach a nearby US military ship was thwarted before it could come to his aid. US troops in the area are continuing to monitor Mr Phillips' situation. He was captured after a struggle on his ship, Maersk Alabama, which also remains in the hands of pirates. Reports said the French rescue operation was not thought to be in the vicinity of the US fleet and the Maersk Alabama. The French operation to free those on board the Tanit began six days after the yacht was seized, the office of President Nicolas Sarkozy said. Earlier in the week Foreign Minister Bernard Kouchner had left open the possibility that troops could launch an effort to free the French hostages, telling reporters French officials knew the location of the Tanit. However, it also emerged that the families on board the yacht, which was reported to be heading down to Zanzibar, off the coast of Tanzania, were urged not to travel through the Gulf of Aden. The region has become a haven for pirates and is the scene of frequent seizures and attacks on international shipping. A spokesman for the French foreign ministry said the couple - named as Chloe and Florent Lemacon - were "repeatedly warned" not to travel through the area. "It is difficult to understand why these warnings were not heeded," spokesman Eric Chevallier said.